LDCNS paper in the top 1% of published papers in Engineering. RSI invited review paper featured in Virtual Journal of Nanoscale Science and Technology. The article, “Invited Review Article: Accurate and fast nanopositioning with piezoelectric tube scanners: Emerging trends and future challenges,” published in Review of Scientific Instruments 79, 071101 (2008), has been selected for the August 4, 2008 issue of Virtual Journal of Nanoscale Science & Technology. The Virtual Journal, which is published by the American Institute of Physics and the American Physical Society in cooperation with numerous other societies and publishers, is an edited compilation of links to articles from participating publishers, covering a focused area of frontier research. You can access the Virtual Journal at http://www.vjnano.org — You can download the review article from here. 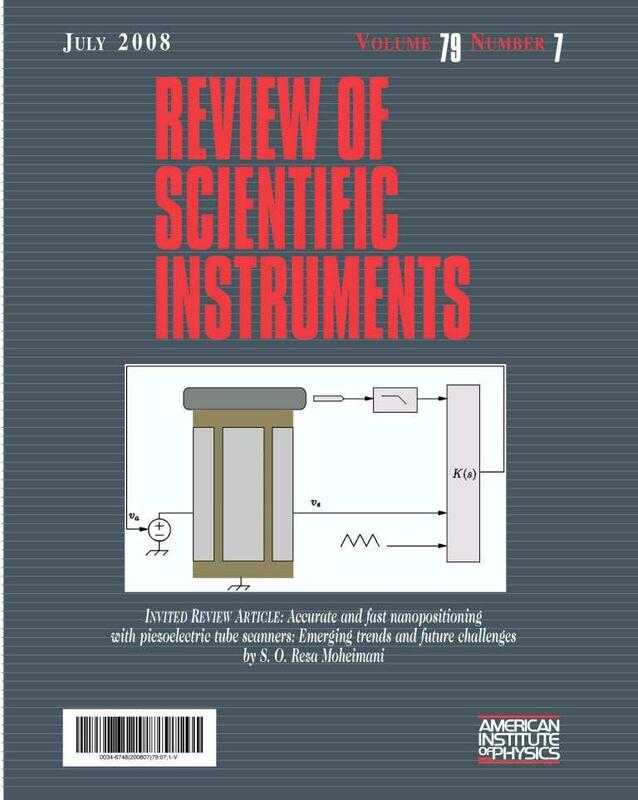 The review article was also featured on the cover of Review of Scientific Instruments — You can see the cover here. The paper, “Design, Analysis and Control of a Fast Nanopositioning Stage” co-authored by Yuen Yong, Sumeet Aphale and Reza Moheimani was selected as a finalist paper for the 2008 IEEE/ASME Advanced Intelligent Mechatronics Conference Best Paper Award. Our recent collaborative research with University of Washington, Seattle has been featured as a news item on http://nanotechweb.org – a community website for nanotechnology professionals published by The Institute of Physics, UK. Read the news clip. Reza Moheimani has been elected as a Fellow of the Institute of Physics (United Kingdom). We have initiated collaborations with University of Glasgow. The main thrust of our collaboration is to utilize Bond graphs for modeling of nanopositioning stages, and their control. Contact person: Bharath Bhikkaji. We have initiated collaborations with the University of Stuttgart . Our collaboration is focused on developing FEM models of piezoelectric tube actuators suitable for controller design purposes. Contact person: Andrew Fleming. We have initiated collaborations with IBM Zurich Research Labs. Our collaborations are mainly in the area of controller design for probe-based data storage systems. In particular, development of controllers for self-servo writing process. Contact person: Reza Moheimani. A Polytec MSA400 MEMS characterization system will be installed in the lab in February 2007. This equipment is purchased using the ARC LIEF grant “Nanopositioning Facility for Nanoscale Measurement and Manipulation”, and is the first one to be installed in Australia.